Suzuki has taken the covers from its all-new SX4 Crossover and impressed with its revamp. The Suzuki SX4 Crossover is a production model based on the S-Cross, which the firm showcased at last year’s Paris Motor Show. Suzuki’s designers and engineers began developing the new model as a successor to the current SX4. During development the designers were overtaken by the rapidly expanding crossover segment in Europe and the Suzuki SX4 Crossover is the answer to their ‘think bigger’ aim. So while moving into the C segment with its increased size, the new model inherits the ‘SX4’ emblem to show that Suzuki, represented by the letter ‘S’, is a pioneer of both crossover and four-wheel drive , indicated by the ‘X’ and ‘4’ respectively. Suzuki has a great track record for producing excellent, but vastly underrated, off-road vehicles and the Suzuki SX4 Crossover should go some way to fixing this. Suzuki has used its experience and technologies by uniting its compact car know-how with knowledge honed from its sport utility vehicles. As a result of focussing on giving the new Suzuki SX4 Crossover a distinctive crossover styling, class leading space for passengers and luggage, as well as next generation 4WD performance and one of the lowest CO2 emissions in the segment, the Suzuki SX4 achieves a remarkable combination of styling, performance and fuel economy. There’s also the world’s first double sliding glass panoramic sunroof which creates one of the class’s biggest opening areas. The Suzuki SX4 is a model which can offer great driving enjoyment and versatile family usage for even more people in an even wider range of situations. 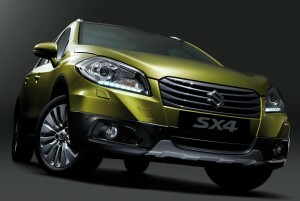 The Suzuki SX4 will be built at the firm’s plant in Hungary and will go on sale later this year. This entry was posted in 4X4 Car, Car Updates & Releases, Crossover Cars, New Cars and tagged car, Europe, fuel economy, GM, Hungary, LS, MoT, New Suzuki SX4 Crossover, Paris Motor Show, Sport, suzuki, Suzuki SX4, Suzuki SX4 Crossover, UK by Steve Lumley. Bookmark the permalink.